MSU Extension Intern- Logan H.
This week I was given random tasks. I worked on a task that I had not done before, which was working on inventory. I took inventory on all the cattle publications from the department and I also re-organized them by publication number. Many of the publications had been misplaced into the wrong folder. This made the process longer because when I was counting, I would find a wrong publication mixed in the stack. Time and again I had to recount and add numbers to the publications I had already gone through. A majority of the publications were informational and directional for local ranchers and farmers. 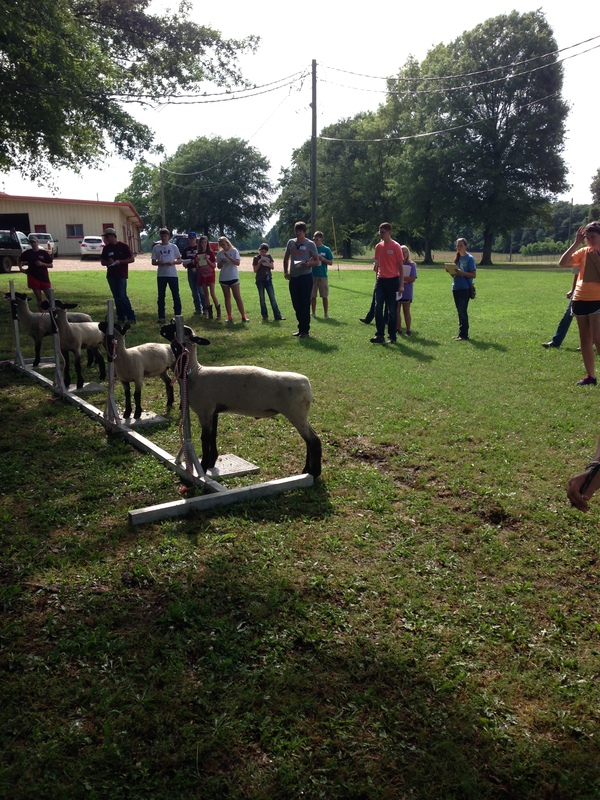 The readings varied from how to manage a pasture, to pinkeye in cattle and how to treat it. I also worked again on making horse/livestock judging packets. I think I have surpassed the 400 mark now. There are still many left to make. I will continue to work on those packets for the upcoming events that they will be used for, which include: the State Fair, the Dixie National Livestock Show, and another judging event in between those two events. I also helped Ms. Shook and Dr. Jousan proof signs made for the contestants riding in the regional horse show that will be held in Raleigh, North Carolina. Dr. Jousan will be leaving this Saturday to drive up there and begin setting up everything for the show. The contestants are given laminated signs with their county, horse’s name, and their name to hang on their stall. It is also a memento for them to keep. I went through all of them with Ms. Shook to make sure all the spelling was correct and to make sure that none were missing. Many of the contestants had more than one sign because they are competing on more than one horse. After we concluded they were all correct and present we boxed them back up and added them to the heap of things that Dr. Jousan will have to carry to Raliegh. I also proofed the entries for the contestants that were put into a spread sheet. I had make sure the events they were going to compete in followed their name and also that their entry number matched. I made a few spelling corrections and then Ms. Shook fixed them on excel. Lastly, this week I worked on another project for Mr. Crow. He needed help with making a design on a bulletin board for the livestock judging team. The bulletin board is in the hallway here in the Animal and Dairy Sciences Department. One of Mr. Crow’s judging students, Justin Hall, helped me come up with the design and he went to Hobby Lobby to get the supplies. We will put the board together this coming Friday. All in all it has been an enjoyable week. My creative skills were used to design the bulletin board to make it presentable and interesting. I also used organizational skills to take inventory on the publications. Next week I will be working on judging card packets again as well as a few other things for Dr. Jousan. Soon I will be helping Dr. Karisch get things together for the Deep South Stocker Conference that will be held in Meredian on August 8. This will be my last event to assist with as the 8th of August will be my last day of work. Well this week I was moving slow, still trying to catch up from the horse show last week. I cleaned out the cooler from the horse show that still had drinks in it and then I worked on clearing out papers from old horse shows. I went through files and then I cleaned out old score cards from shows with lambs, steers, and market goats. I proofed the regional entries for the regional horse show that is coming up at the end of the month for Dr. Jousan. I am pretty happy to not be going to another horse show, as it is tiring and long. The regional horse show is going to be held in Raleigh, North Carolina. 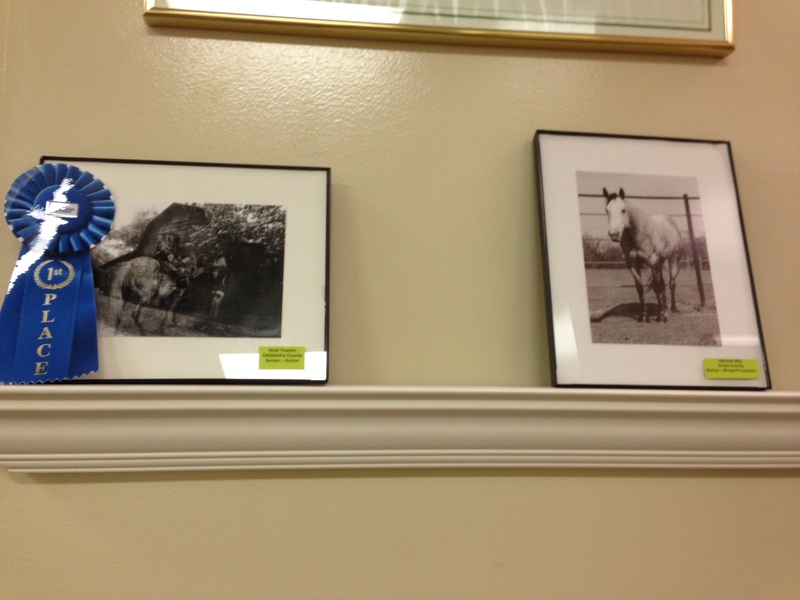 After I had finished clearing out files, I labeled and put up the photographs that kids submitted in the 4-H contest. The pictures I hung were the winners for each category. The photos were of excellent quality. Many of the 4-H kids are very talented. This week I was surprised with a nice thank you note from Mr. Crow, the livestock judging coach, for helping with the livestock judging camp he put on earlier this month. It made my day, to know I was helping and doing a suitable job with my tasks. Due to the holiday this week, it was dull and quiet, as most of the people in the office were on vacation. Here in Mississippi, many companies shut down the entire week of Fourth of July, as many people use this week as their summer vacation. My tasks grew fewer and farther between as the week drug on. Thursday I printed labels and labeled envelopes to be mailed out for Dr. Karisch. Next week will be busier as I will be helping Ms. Jennifer Williams again. I will assist her at the dairy camp being put on here by campus at the old bull barn. Then, Wednesday next week, I will go with Ms. Williams again for a NASA camp that it being put on for 4-H students. I am not sure what will all be involved with these camps, but I feel they will be interesting. It will be nice to have some new scenery. Throughout this week, I practiced my organizational skills by helping with clearing out files and having to re-arrange folders by county. I also had to organize the regional horse show entries that I proofed. Overall, I just tried to keep busy. With so many people gone it was hard to find things to help with, especially because I completed all the work I had to do on Monday and Tuesday. On Wednesday morning I restocked the cooler that I drained and cleaned out for Dr. Jousan so he can take those beverages with him to the regional horse show. I am looking forward to the camps that I will be assisting with. Next week should be more upbeat and interesting. The entire fourth week of my internship, I was staying in Jackson, working at the 4-H State Horse Show. It was an interesting experience to say the least. It was a long week as I worked many hours. The highlight for me though, was meeting so many different people, meeting different extension agents and also meeting a woman from the Animal Board of Health. My tasks varied throughout the week, although a majority of my days were spent working in the office, doing check-in for all the kids who were participating. Monday, when we arrived at the coliseum, many people including myself, helped unload the trailer with everything we needed for the office. After everything was unloaded, I went and labeled horse stalls by county. The first morning of the horse show, I helped some agents that were upstairs in the coliseum, by making grading keys for the hippopology contest. I also entered the scores for the kids participating in each competition that morning. The hippopology contest tested these participants knowledge on horses, tack, and different horse events. After I finished helping with this, I went downstairs and learned the ropes for working in the office to help with check-in. For the rest of the afternoon I worked check-in with three other agents. Another task I helped with was setting up tables and unpacking artwork from 4-H students that entered their work in the art contest. There were many talented students who entered amazing pieces of work, from sculpture to home décor pieces, that all had to have an image of a horse or be revolved around the horse. Every morning there were little things that had to be done in the office before the day started, such as, draining and filling coolers with water, Gatorade, and other drinks. When I began the day and was preparing for people to come in and check-in for the show, I and the other women had to get the binders out with contestant’s names and have the envelopes with the back numbers by county out. When people would come to get checked-in we had to see their grade/registration papers on their horse and their coggins papers on each horse. Ms. Angeliki Polles from the Animal Health Department was there working with us to verify and check people’s coggins papers on their horses. After the competitor was clear on their papers, we had to give them their back numbers, a program if they wanted it, and a pattern book for the different events. When I was done at night with check-in I would go upstairs and get to watch some of the kids compete while I was at the regional table with some of the agents. I saw the jumping class one night, reining, and then on Saturday I saw a few barrel runs. On Saturday, my last day there, I went to look at a horse someone was giving away for an agent who was interested. To my surprise the animal was in need of attention physically. After I returned to the office to let the agent who was interested know about the horse, she and I spoke for a while and I expressed my concern for the horse. I also expressed my concern that I felt if no one took the horse, that it would be left behind. After quickly realizing that this could end badly for this horse, I decided the right thing to do was to call Ms. Angeliki Polles and let her know about the horse that way it would get taken care of, if it was left behind. Overall, I enjoyed my week working with so many wonderful, dedicated people. I enjoyed meeting and speaking with everyone I came into contact with, and also learning from them, the odds and ends of the horse show and other events that extension agents help put on. I feel my skills in communication, as an achiever, and in being futuristically oriented have been strengthened this week by having so many new things thrown at me. I also feel my skill in ethical reasoning was enhanced by dealing with the horse that was in need of attention. I worked, learned, and planned with the other agents to keep everything running smoothly for other workers and the participants involved with this horse show. All in all it also helped me to appreciate a hard day’s work and how much effort these agents give to make so many events possible. Well this week I helped Ms. Shook with preparing different items for the 4-H State Horse Show. I helped sort back numbers by county and also did all the labels for the horse stalls at the fairgrounds. I traveled to Winona on Tuesday for the 4-H cookout contest and helped with doing the placing’s for the category of less expensive steak. There were three kids in the junior’s category for less expensive steak and three senior kids for the same category. To me, the kids seemed to enjoy themselves and had a fun time. The overall winner that was chosen out of the eight winners from each division was an 11/12 year old girl. She was so excited! The kids seemed enthusiastic about participating in this contest. I actually recognized this one little boy from the livestock judging day camp that I helped with my first week, and he ended up placing second in his division. Unfortunately, I did not get the opportunity to sample any of the meat that was cooked, which was sad because I was starving! Later in the week I had to help load the extension trailer that Dr. Jousan hauls down to Jackson for the state show. I helped load the trophies and awards for the show. By working at the cook-out competition in Winona, I was participating in civil engagement. It was nice to help set up and work with other agents that support so many 4-H students, who are hugely affected by this wonderful program. It not only gives the kids a sense of pride and accomplishment, it also teaches them to be responsible, civic minded individuals. Many of these kids will eventually have their own families and will have their children participating in the 4-H program. So looking at it from this view, 4-H teaches children many things, but it creates a continuous circle that produces civic-minded individuals, who want to help their community and fellow neighbor. In the week coming up, I will be traveling to and working in Jackson for the state horse show. This event will prove to better my communication skills, my skill in maximizing my resources, by juggling so many work assignments, and also it will increase my skill in context in which I will draw on past experiences to help me understand new assignments while working next week. I am excited so see all the events, meet new people, and also to shop while I am there. I have a weakness for clothes, and jewelry vendors at rodeos; they sure know what I like! As a side-note, I am also excited because my birthday is next Monday, the day I leave to go to Jackson. With the diversity in the tasks I have been given so far, and the events I have attended, these things have widened my view into not only understanding what all an extension agent does, but also these events have bettered my skills as a leadership major. MSU Extension Intern- Week 2- Logan H.
On Monday June 9, I helped Mr. Crow, the livestock judging coach with getting some things organized for the three-day livestock judging camp he was putting on. I helped label and organize the room assignments for the high school students who were going to stay in the dorms here on campus. Later that morning I helped Mrs. Crow with the check-in of all the students by giving them the keys to their rooms, the maps of campus, and their schedules. Later that afternoon I took photos of the kids judging sheep out at the beef unit. From Wednesday through Saturday I was out of town helping with the Northeast 4-H district horse show in Verona. Ms. Jennifer Williams, an extension agent for Webster County, and Ms. Lisa Stewart, the county coordinator were the two women I worked with. Ms. Williams and I worked the check-in table together; she checked the competitor’s registration papers and I would get their back numbers for them. On Friday, we were working the check-in table, when all of a sudden we heard someone screaming out of distress and pain. A 4-H student was coming through the alley way with his horse and somehow the horse was spooked and had pushed the boy up against the hinge on the panels in the alley way. As everyone crowded around, Ms. Williams and I went and got chairs for the boy’s parents so they could sit with him as they waited for the ambulance to arrive. As I looked on I saw Ms. Stewart calming and comforting the student’s mother as they waited. As it turned out the boy was fine just sore and his muscles hurt in his back. He returned later to the show to watch. On a happier note, I met two little girls who were in the special needs class for western pleasure- showmanship and they were delightful. It was nice to see other adults and children giving encouragement to these girls by letting them know they were their fans. After the girls were told by so many people that they were their fan, they began signing autographs for everyone. Paige and Waverly, the two girls, came to the check-in table to give us their autographs and I spoke with them for a moment. It was a happy experience to feel grateful for what I have been blessed with, but also to see that I and others had brought smiles to these girl’s faces. With all these experiences this week, I am able to make connections to the things I have learned from my major in leadership. My skills have improved in collaborating with others to help organize the check-ins for these events and also it helped me to better my communication skills. Throughout my leadership classes, the concept of empowering others has come up time and again. By giving encouragement to those sweet girls, Paige and Waverly, I feel it did empower them and I helped to make a small difference in their lives. On another note, throughout this internship, I have and will keep meeting and working with different people who will teach me new things and I will learn to foster teamwork with different types of individuals. It will also help me to learn how to make things more cohesive in working with different people and teams, whether it is helping to plan and organize events, to also working with others to help benefit the community. Also by working with others at horse shows or the camps I have helped with, these things will help me to further my skill in problem solving by coming up with solutions to hick-ups in my work tasks. I am looking forward to what lies ahead this summer in working with a diversity of people and tasks. The people I have met so far have made my job interesting, as well as fun.